The Most Natural Open Baby Feeding Cup !!! 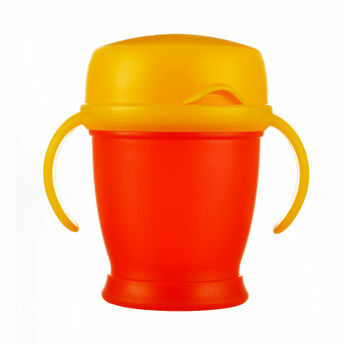 BPA free LOVI 360 cup, trains baby for glass drinking with maximum hygiene and minimum maintenance. Innovative, patented sealing system lets kids drink from anywhere around the cup. Antibacterial protection of silver granules in the valve, which kills 99% bacteria within 24 hrs. of use. Just 3 components, easy to clean and maintain. Comes with a hygiene friendly cover. Enlarged, stable base with extra rubber for rounded edges. Additional Information: Lovi products are especially designed keeping in mind that the products are an extension of the mother. The dynamic Lovi bottle and teat are designed so a baby can actively suckle in the same way as it does on a mother's breast. These products are a result of outstanding doctor's research in the field of neonatology and pediatrics over years. Exceptional importance is given to safety and mother's feedback while designing new products. Every product has features which are necessary for active parenting. The products are tested rigorously for microwave, dishwasher, physical strength and quality standards. Each product has been carefully labeled with required guidelines for precautions and safety. At Lovi, the safety of your child is of paramount importance to us. 1x 210 ml cup, 1xcollar with valve, 1xcup cover, 1easy grip handle.